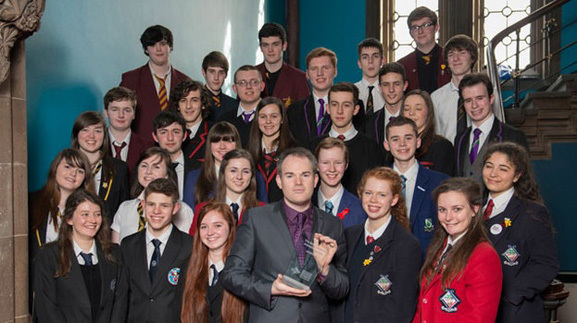 Watch the final debates of the STV Debating Matters Referendum Schools Debate, Saturday 12 April! Debating Matters teamed up with STV last year to give secondary school pupils across Scotland the opportunity to debate the big issues in the run up to the referendum on Scottish independence this September. The Scotland wide competition hosted eight regional preliminary rounds last autumn, and the semi-finals and the final were held at at the University of Glasgow in March, bringing together eight finalists, four debates, a dozen distinguished judges and a large TV production crew. The results of the final debates, and who picked up the winners trophy, have been kept secret but and will be revealed in an hour long programme, ‘Referendum: The Next Generation’ which will be broadcast this Saturday 12 April 2014 at 17:40 on STV, and will later be available on the STV Player. Tune in on 12 April! For further information about The Referendum Schools Debate please visit the dedicated STV website.